EDISON RESEARCH's LARRY ROSIN takes a look on his most recent blog post at where we're finding out about new music nowadays. He writes, "I've mentioned before that one of the great things about our Infinite Dial research series is the chance to track items over a long time. One area we can see huge changes in is for the notion of 'music discovery.' 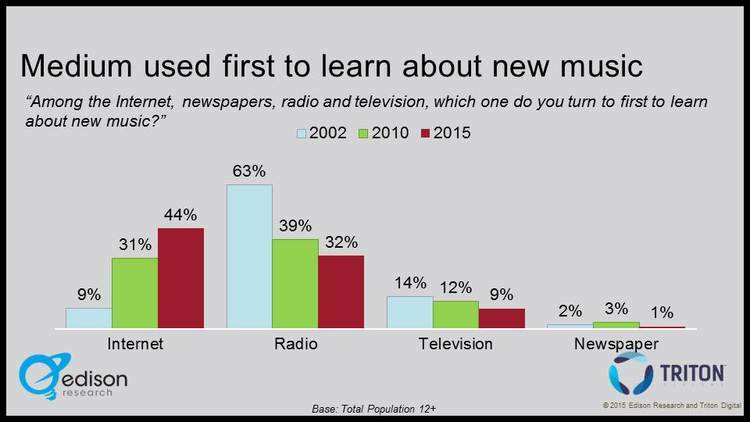 As the nearby graph shows, our tracking data shows that over the course of the last 13 years 'Radio' has been supplanted by 'Internet' as the source Americans turn to first to learn about new music." ROSIN continues, "Whereas in 2002 Radio enjoyed a 7-to-1 advantage over Internet, by this year's most recent study the Internet had blown past Radio by a sizable margin. The numbers among 13-34 year olds are, no surprise, much more dramatic. At the same time, it is clear that notwithstanding the above, artists and labels want nothing more than to get their songs onto the radio. Even as its place for 'discovery' drops, the importance of getting songs on the radio seems as significant as ever -- or possibly even more so."